Many times, I half wondered why some little smarty-pants wasn’t capitalizing on all of that free wind power and, instead of toppling pedestrians, turning it into an energy source for their high frequency trading systems. Although modifications to building sites and parks have tempered the whipping winds in the city, the earth’s gusty power just keeps on blowing. Wind has been used by humanity for thousands of years as a source of power but only truly institutionalized in the US as a result of the energy crisis in the late 1970’s and early ‘80’s. Today, more than 90 countries have installed wind power plants, and 9 countries have more than 10,000 MW (megawatts) installations with China leading the pack with more than 43% of the world’s wind power production. You probably thought that politicians are the source of wind but outside of government blowhards, wind is actually produced by the uneven heating of the earth by the sun. Wind energy is truly everlasting and is major alternative to fossil fuel, making it a perfect target for mission- oriented investors. As promised in last month’s post, Mission Possible, I’m fixing to focus on one of our Wind Power portfolio companies. Ignoring the dire warnings from scientists that we can only burn a small portion (less than 15 percent at maximum) of already-proven fossil fuel reserves if we are to prevent devastating climate change, governments worldwide continue to ramp up incentives to coal, oil, and other fossil fuel production. In the US, lawmakers are encouraged to subsidize the production and consumption of fossil fuels to the tune of $27 billion…per YEAR. This is not sustainable on any level but, alas, we will not journey down that rabbit hole (or drilling hole), at present. 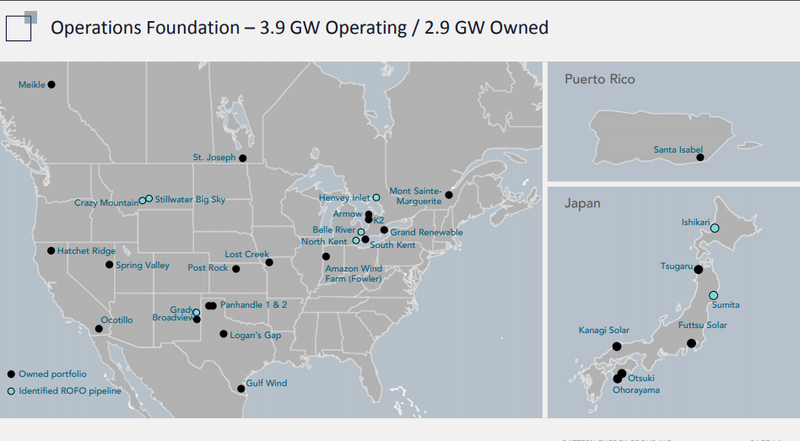 Pattern Energy (NASDAQ: PEGI $18.89) is a US based wind and solar power generation company that produces and sells electricity mainly in the United States, Canada, and Japan. PEGI buys wind energy projects that generate electricity from Pattern Development, a sister company of which PEGI owns 29%. PEGI currently has 25 operations and owns a capacity of 2.9 gigawatts with 9 more projects in its pipeline. PEGI has a guaranteed buyer for 92% of PEGI’s produced electricity at a fixed price and those contracts have an average remaining duration of 14 years with companies that have A+ credit ratings. Yes, you read that correctly. But wait, there’s more. PEGI pays an 8.9% dividend and their dividend has increased more than 35% since 2017. PEGI is profitable and continues to fire on all (wind powered) cylinders. The US wind power market is still young with only about 6.4% of US electricity produced by wind. Utility-scale wind plants in 41 states have created more than 100,000 jobs for Americans and, even in our current pro-fossil-fuel culture, wind and solar projects continue to gain ground. Global wind power installations as of 2017 are 539,123 gigawatts, which is up more than 10% from 2016, and the forecast calls for double-digit growth in wind power installations from 2019-2022. On October 8th, the Intergovernmental Panel on Climate Change (IPCC) issued stark warnings which urged far more ambitious action to cut emissions by 45% by 2030 and reach net zero emissions by 2050 in order to keep warming down to 1.5C. Calling this a moral obligation on the part of world leaders, the IPCC report called for a ramp up installation of wind and solar power, decommissioning of coal plants, and investment in climate-friendly sustainable agriculture. Most businesses will not be motivated to action if their primary profit centers are on the chopping block. Remember tobacco? Diamonds? It’s up to the financial forces that fuel investment (that’s us!) to commit our capital in a future-forward manner. Investing in well run, profitable, value investments (like our PEGI pick) is a choice way forward. Another positive light is the RE100, an initiative for global companies to use electric energy from 100% renewable sources. RE100 currently has 152 global companies, many of which are Divine portfolio companies, committed to transparency and accountability – they even publish a RE100 Annual Report. It makes extraordinary sense to invest in profitable companies seeding the future that pay us dividends to wait. Next month I’ll get down with an infrastructure play but, until then, take your vitamins and pay your taxes. Older PostIs it Time for a Financial Plan?